Enjoy a good cup of coffee on the shores of lake Åsnen! With 3 bicycle routes the shop is the perfect starting point for a day trip. 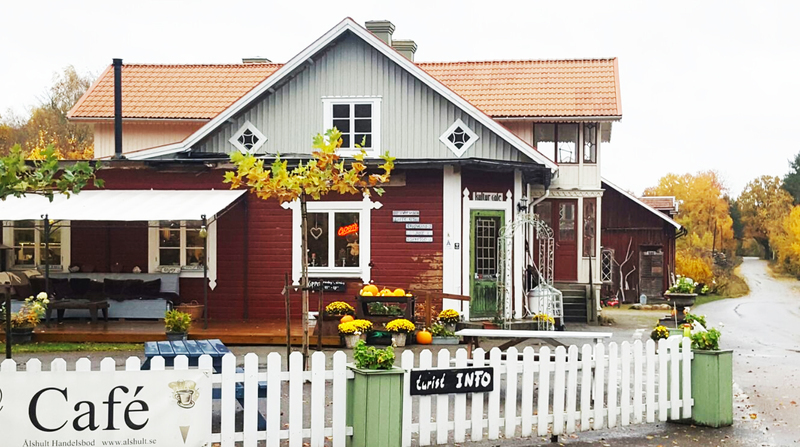 Situated along 4 bicycle routes and a canoe route, and only 1 km away from road 126, the shop is also the perfect starting point for a daytrip by bike or canoe. We are one of the Tourist Information Points (TIP) in Tingsryd. We offer a wide range of brochures, free Wifi, and a computer to help you find South Swedens finest places. Enjoy a good cup of coffee or tea on our terrace, with a lovely view over lake Åsnen while you’re planning! In our kulturcafé we organize exhibitions, workshops and music evenings. On our shelves you’ll find local art and handicraft such as forged iron, handmade glass, painted candles, bronze, carved wood, ceramics,handmade jewelry, pictures and paintings. We also sell some local products provided by nature itself: honey, apple juice and eggs. In the shop you'll find tourist information, internet, history, homemade furniture and local art.